Computer technologies offer new tools to the designer’s palette and influence the style and aesthetics of a film. The ConceptDesignWorkshop will look at the tendencies in progressive production design such as the Wachowsky Brother’s feature “Speed Racer”. The course will also look at the development of artificial environments during the process from pre-production to post production. • A hands-on design workshop will explore the experimental use of mixing traditional and digital media. After getting familar with photoshop and its possibilities participants will move towards the creation of a design visual as it is used in the art department. • Participants will produce a concept sketch illustrating a film set or design idea while making extensive use of applied tools such as 3-D and photo reference. This two day course is aimed at Art Directors, Trainee and Assistant Art Directors, Junior and Senior Draughtspersons, Art Department Assistants and Production Designers with some knowledge of photoshop. 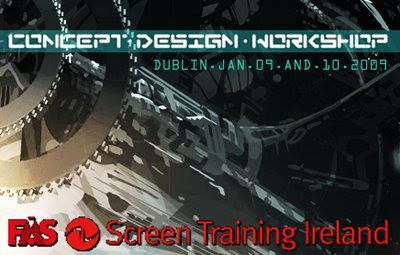 Please apply online at www.screentrainingireland.ie by the 16 December 2008. Peter Popken is a concept artist, visual development and storyboard artist for the film industry. His work spans more than 15 films including: "Speed Racer", "V for Vendetta", "The Bourne Supremacy", "King Arthur" and most recently Disney's "Prince of Persia". His work is featured on several web galleries and art books. 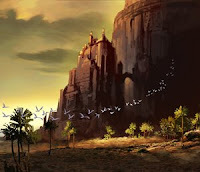 Further he developed visual ideas and aesthetics for PS3 computer games. Peter holds a diploma in visual arts & communication and has been tutoring workshops at film schools. fmx/09, the international conference on the creation, production and distribution of digital entertainment takes place in Stuttgart from May 05.-08.2009. Numerous panels, workshops and presentations draw a discerning audience, two-thirds of whom are professionals while one-third is made up of students - just right for the driven atmosphere that makes FMX the primary European meeting of the digital community and thus a great networking experience. Innovative approaches in the animation, visual effects, gaming and postproduction industries form the focus of qualified discussions in fmx/conference. Among the hot topics will be immersive design, transmedia storytelling and world-building as well as new stereoscopic features, 3D Stereo for home and mobile entertainment and new game-driven realtime technologies for previs and production.